Each week this summer, we brothers are happy to welcome so many young people to our hill. The great diversity of countries and the solidarity that develops among all give rise to a constant astonishment. Last week a group of Palestinians from Bethlehem were here; they shared their suffering with us. And this week a Palestinian woman from Gaza is with us. We are also touched by the fact that, each week, young people from Ukraine are with us, and at the same time young people from Russia. To all of them, I would like to say: know that your presence is important for us and, in our hearts, we are very close to you all. It is important for us, in the prayer together, often to sing a song in Slavonic, the liturgical language of the Russian Orthodox, and also to sing in Ukrainian "Laudate omnes gentes", "Slavite vsi narodi." Being together, listening to one another, confirms in us all this deep conviction: in every country there are women and men of peace. We meet three times a day to pray together. It is Christ who unites us and gives us his peace. If we do not begin by receiving his peace in our hearts, how can we be creators of peace around us? If we do not first welcome God’s peace, can wounds, sometimes terrible ones, ever be cured? I think of children injured or even killed, of countless refugees across the world. Tirelessly the Risen Christ, who alone has conquered hatred, violence and death, the Risen Christ says: "Peace be with you." He is our comfort. He gives us the courage to be peacemakers. "Blessed are the peacemakers: they are children of God", Jesus also says. Listening to Christ leads us to listen to others. To be creators of peace, we need to take time to understand the viewpoint of others. Then our eyes open to see signs of hope, even at the heart of difficult situations. And we are driven to come close to those going through trials. Making peace starts in our everyday relationships with our loved ones. We can hope to be peacemakers in society and in today’s major conflicts, only if we are this first of all in our relationships with our families and friends. 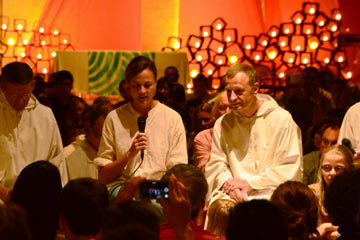 I so much wish that all of you who come on pilgrimage to Taizé are able to lay down here even only a small part of your burdens, your personal burdens as well as those of your country. And that you can welcome into yourselves Christ’s peace. Tomorrow night we shall have the prayer around the cross. It reminds us that Christ takes everything upon himself. That is why he came. The Gospel tells us that he is the Lamb of God who takes away the sin of the world. Are the inextricable situations of hatred and violence that we see in the world not a call to deepen our trust in Christ? Is it not from this depth that we must draw the courage to become women and men of peace? Without this constantly renewed trust in Christ, it will not be possible to halt the spiral of violence fed by arguments that are truly or apparently just. It is this trust in Christ that enables us to believe that reconciliation is possible. This Friday August 1st at 4pm a bell will ring for three minutes. It will be the same in all the towns and villages of France. This is because it will be the hundredth anniversary of the outbreak of the First World War in 1914. While the bell rings, wherever we are, we will stop what we are doing to remain in silence and pray for peace. Among us there is a woman deeply involved in solidarity work with refugees in Europe. Her name is Amaya. She lived in Cambodia for a long time. Now she works for the Jesuit Refugee Service in Rome. She will speak to us. But before this a child will say the names of the peoples who are here tonight and the children will distribute flowers to them. Amaya: I have a friend in Damascus, Syria. Every day he hears the bombing when he goes to work. He tells us: "If Christians disappeared from the Middle East, it would be as if a spring of living water disappeared. This could change the identity of Christianity in the whole world." Faced with such challenges, how can you keep hope alive? In Aleppo, young Christians and Muslims are working together to bring food to families in difficulty. This joint service provides a strong sign that reconciliation is possible. My friend also keeps alive hope that peace in Syria is possible. When we are tempted to lose hope, his hope keeps ours alive.